Big T.’s Heart’s In Me! A book for children of all ages, designed to promote seat-belt safety and organ donation; based on a true story as told through whimsical animals. Valerie gifts $1.10 to Donate Life America for every print book sold, promoting organ donation. 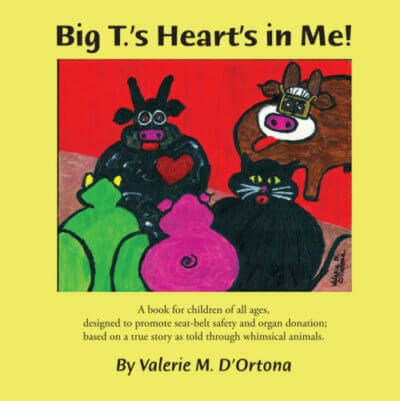 Isabel is usually a happy bovine, frolicking through pastures, and cavorting with her friends in Isabel’s World, and she is THRILLED with the outcome of her book, Big T.’s Heart’s in Me! However, the subject matter is the bummer. Kenneth Anthony “Tony” D’Ortona died on Father’s Day, June 15, 2008, the only child (born 1974) of Isabel’s creator Valerie D’Ortona. This loss, though kick-in-the-gut-wrenching, eventually evolved into her grief journey of writing and painting. Tony had already registered to be an organ donor, so upon his death, Valerie and Tony’s father, Kenneth, honored Tony’s wishes. Consequently, his heart, kidneys, liver, and corneas were transplanted into five desperately ill, lucky people. Valerie painted Tony’s story in the whimsical style of Isabel’s World. “Big T.” (a large bull painted on a barn) served as the main character although he never uttered a “Moo.” The book explains through Toby (a younger, formerly ill bull) how Big T. ventured off to Wyoming to cook in a resort. After only six weeks at Jackson Hole, Tony and a friend of two weeks were returning to work from Salt Lake City. She fell asleep at the wheel; the truck hit the guardrail; Tony was thrown from the tumbling vehicle. Thirty-six hours later, declared brain dead, he was being prepared for donor harvesting. In Big T.’s Heart’s in Me! book, as Toby explains to the frog, cat, and pig, a previously ill Toby ends up the recipient of Big T.’s heart. An educator, Valerie designed the book to serve as a learning tool for children (of all ages). She illustrates organ placement in Big T.’s body, provides a glossary to define terms, encourages people to fasten their seat belts, and urges readers to register to be organ donors. “This is a beautiful real-life story that can be enjoyed by children everywhere and that will touch not only their young hearts but also the heart of the parent or grandparent (or teacher) who may be reading it to them.” Reviewed by Jim Gleason, heart recipient.